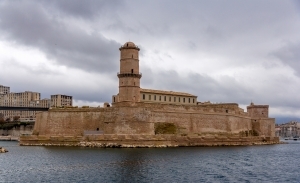 Fort Saint-Jean is a fortification situated at the entrance of the Port of Marseilles, just in line with Fort Saint Nicolas located on the other bank of the old port. It looms above the J4 pier, and offers spectacular views of the city of Marseilles, the Basilica of Notre Dame de la Gard, and the coastline west of Marseilles. The Fort is adjacent to the Museum of European and Mediterranean Civilizations. It covers a site of 1.5 hectares and is built on a natural hilltop. 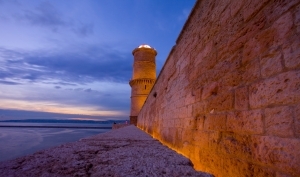 Fort Saint-Jean is a military complex integral to the history of Marseilles. Its foundations date back to the late 12th century, when it was a command post established during the crusades by the Military Order of the Knights Hospitalliers of Saint John, which gave it its name. 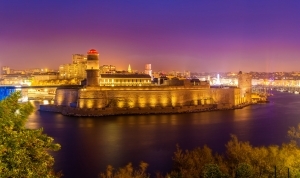 The fort itself dates back to the 17th century, when King Louis XIV decided to strengthen the city’s defences in 1660. Two earlier buildings, that is the commandery of the Order of the Knights of Saint John, which served as a monastic hospice during the Crusades, as well as the fifteenth century tower of René I, King of Provence, built in the mid-fifteenth century, were incorporated into the structure of the fort. During the French Revolution, in 1790, an unruly mob seized the fort and decapitated the commander of the Royal garrison. During the revolution the fort was used as a prison, holding amongst others the Duke of Orléans, Louis Philippe II, and his two sons. Following the overthrow of Robespierre in 1794, about a hundred Jacobin prisoners who were being held in the fort were killed. Throughout the 19th and early 20th centuries, Fort Saint-Jean was in the possession of the French army, who used the fort as a final clearing centre for the French Foreign Legion members headed to North Africa from 1830 to 1962. Fort Saint-Jean was occupied by the German military in November 1942, serving as a German ammunition depot during the Nazi occupation of Marseilles throughout World War II. In 1944, some of the ammunition stored within it exploded, destroying much of its historical framework and battlements. Although it was returned to the French Army, the Fort subsequently suffered a period of neglect, until it passed to the Ministry of Cultural Affairs in 1960, and was classified as a historical monument in 1964. The damaged portions were then reconstructed between 1967 and 1971 under the supervision of François Botton, Chief Architect of Historical Monuments, however the full remodelling was completed only recently in 2013, whereupon the fort was linked by two thin bridges to the historical district of Le Panier, and to the French national museum. The Department of Underwater Archeological Research was housed there from 1970 to 2005. Today Fort Saint-Jean represents a meeting point between the city and the museum. It is an exhibition space for permanent collections. It also hosts temporary exhibitions, while offering visitors a stroll through its ‘Garden of Migration’, a 15,000 metre open-air space featuring regional plants, trees, and herbs. The fort is connected to the J4 pier by a 115 metre-long footbridge. A second footbridge, 70 metres long, was built between the port and the front of the Eglise Saint-Laurent in the Panier district. There are nearly 1,200 square metres of exhibition space, which mainly host collections of the MuCEM (the Museum of European and Mediterranean Civilizations), in the Chapel of Saint-Jean and the Gallery of Officers, amongst others. The Guard Room, located in the upper part of the fort, houses audio-visual equipment that gives visitors an overview of the building’s history and architecture. White there is a charge to view the exhibitions, access is free to the gardens, coffee shops, and restaurants that surround the fort, as well as the open-air theatre and scenic walks.